Which one of your friends would you like to read about? Name a character in a book who made a mistake. If you had been that character, would you have made the same mistake? Can you guess the ending of a story? Can you talk like the characters in the book? What lessons could you learn if you were in the story? As you provide the spotlight on possibilities in literature, children will see things they might have missed on their own and will be invited to jump into the stories and play with the characters, and help them solve the story's problem. Tapping into children's laughter and wonder, this literature collection builds enthusiasm for academic and social skills as well as character development. These award-winning stories and nonfiction books with Kids Wings activities that cross disciplines will invite them to dive actively into science, challenge them in to participate in math, and inspire creative expression across the curriculum. Characters, settings, and situations in selections from the 54 award-winning picture books will open eyes, hearts, and minds with delight and provide a myriad of opportunity to bring books to life in their own lives. Literature will tickle their funny bones and bring welcome laughter into your classroom. At the same time, it will inspire them to learn more, to do projects, and to improve in their reading, writing, science, and math skills while providing scaffolding to high level thinking, cooperative discussion, character building, and more. Our Kids' Wings activities will encourage children to look more closely at the world through literary telescopes and microscopes, leading them into an active, integrated studies that are rich in character, reading and math skills, science, social studies, research, problem solving, internet projects, and FUN...while providing a creative introduction to test-prep practice. and more... all keyed into multiple-intelligences and TEKS Objectives. Great curriculum for your Gifted and Talented Students! Outstanding literature with focused instructional strategies in Bringing Books to Life! help clarify the characteristics of gifted and talented students in your classroom. The real-life lessons cross disciplines and teach strategies for nurturing creative and critical thinking for your gifted and talented students. They increase creative problem solving and group interaction within your classroom. 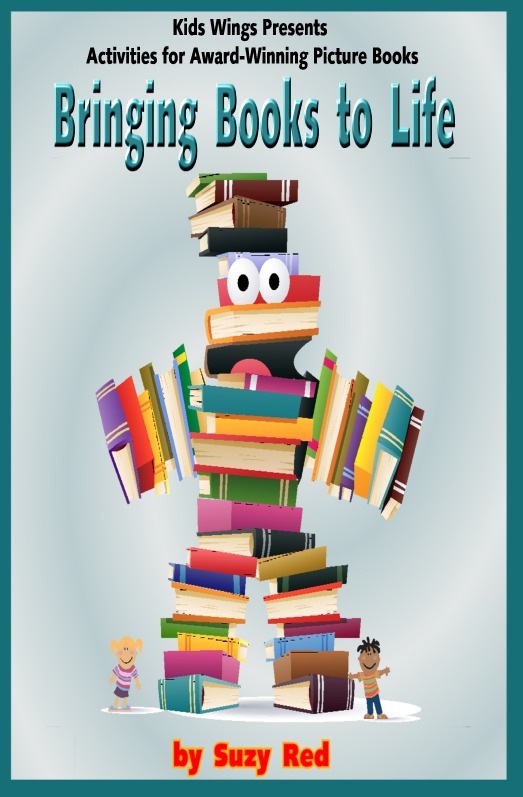 Literature from all genres will inspire your students to discover how books can come to life. Bringing Books to Life! can become your TUTORING program next year! Just give a parent one of these great picture books along with its Bringing Books to Life! study guide and watch them return again and again for the fun of guiding your students into high level learning! Participants will receive the professional guide and CD filled with over 500 pages of unique, active ideas--excellent for literary circles as well as for individual and whole class interaction. Join us for a breath of fresh curriculum that includes laughter, songs, character building, and problem solving through literature. ...receive a valuable Teacher/Student Guide with CD and site license to allow it to be shared within ONE school. ...participate in extension activities for the books. ...explore ways to integrate the curriculum around literature and library resources that enable students to grow excited and skillful in research and cooperative activities. ...understand the importance of their role in weaving respect and character into every aspect of a child's life.